Is working as an expat a choice for life or is there an expiry date? How long to stay and when/how to go are crucial questions for the open discussion. In a subsequent workshop, you will be invited to elaborate new ways of transmitting your knowledge and experience to the next generation of aid workers. 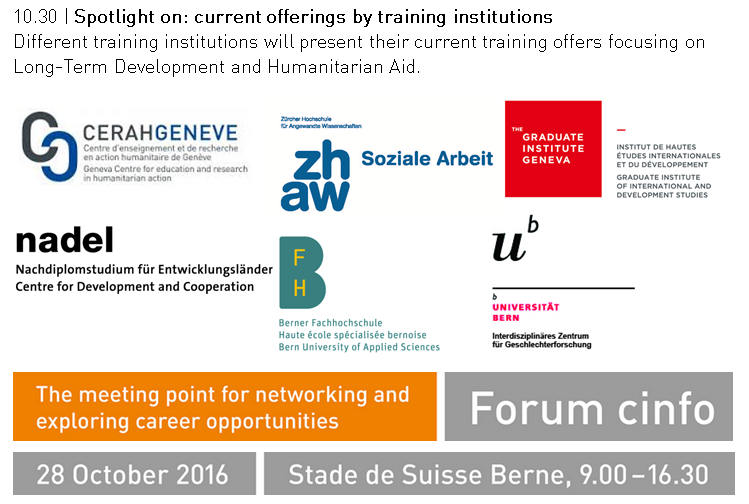 At 13.30, “Lost in Transition?”: one of the exciting panel discussions you can’t miss on the 28 October at the Forum cinfo 2016! One of our many highlights: New players take their role in international cooperation, aid modalities are in transformation, SDGs set new visions. What profiles will be sought in the future? We are very fortunate to have – Mr Thomas Greminger, Deputy Director of the Swiss Agency for Development and Cooperation (SDC) – Ms Eva Mennel, HR Director UNICEF and – Mr Erik Keller, Director Interteam discussing about these topics at the Forum cinfo 2016. Save the date! The Shah Mosque of Isfahan (Iran) is one of the everlasting masterpieces of architecture in Iran. With its 18 million bricks and 475’000 tiles, the mosaic represents a full palette of seven colours: when the light hits its surface, you experience sun, surface- and underwater all at once. No wonder it is registered as a UNESCO World Heritage Site! The Mosque’s majestic construction began in 1611 and was renamed after one of the most “unusual” modern revolutions – the Iranian Revolution of 1979 – which had an immense impact internationally, profoundly changing the image of Islam. Daniel Glinz will be directly going from taking this picture to be one of our speakers at the panel “Lost in Transition”, at the Forum cinfo! Stay up to date on http://www.cinfo.ch/forum! Are you well prepared to tackle a job in development or humanitarian aid or do you feel like you need just a little more training? Sad events such as the recent bombing of an aid convoy in Syria remind us of the importance of security, more specifically, feeling safe in different contexts. This topic will be addressed in a panel discussion at the Forum cinfo. How is security perceived in different countries? Watch this video – you might be surprised.